My farrier, Tony, came out to the house yesterday to remove Tanna's shoes and trim both horses. 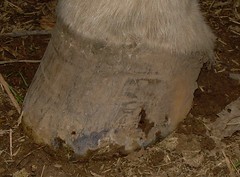 This is a picture of Tanna's left rear hoof, the one that had a chunk break off back in July. The hoof wall is growing out nicely and should be back to normal by Christmas. Tanna will not be idle while barefoot. We will be doing some training and some trail riding. We still have some work days out at the Trace Tribute trail system. And we're going to be focusing on some hill work this winter. So Tanna will be working. Which means I will likely be playing with Easyboots again. I have not had the best luck with Easyboots in the past. Boots flying off, gaiters rubbing no matter what I do. The best experience I had was using duct tape, not flattening down the teeth and no gaiters. But that was only for 3 days in the pasture on one hoof while waiting for my farrier to come out. But I have a full set of Easyboots (4) all the same size. 3 of them are Epics and the other is just an older version I picked up on a sale rack. But still a full set. So I will probably be playing around with those.